After an absence of many years, the classic SF series Babylon 5 is back on British screens. The Watch channel are showing it from 5pm tonight. They will transmit five episodes a week, including the TV movies. 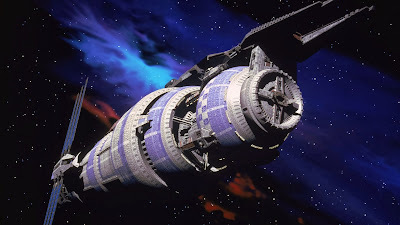 This move is a direct response to the 'Free Babylon 5' campaign being undertaken on Facebook. This campaign aims to improve the visiblity of the series and get it back on the air in the United States and to also, if possible, convince Warner Brothers to fund a HD remastering of the series, similar to the one that's being done at the moment for Star Trek: The Next Generation and, for next year (according to rumour), The X-Files.